The mighty Dog Head engaged humanity first in ancient Egypt, turning up in the South Pacific a millennium later. After centuries of worship by Micronesia Islanders culminating in their exodus from Easter Island, the giant Doggie Diner Dog Heads eventually landed on the San Francisco peninsula, blending into the local culture by taking up residence atop poles at a local hamburger chain. In 1988, the Heads were adopted by the San Francisco Cacophony Society and became iconic symbols of worship for The First Church of the Last Laugh, eventually attaining beatification as The Holy Trinity of the Dominican Order by decree of Church Elder Bishop Joey. 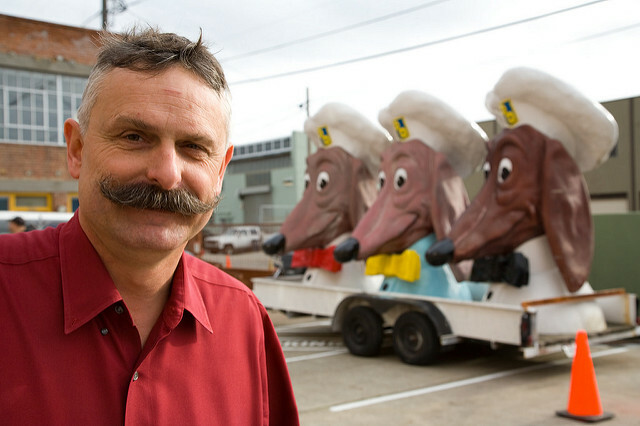 From that year on, the three sacred Dogs have blessed a great variety of local SF-East Bay functions by their ambulatory presence. They have also toured the United States coast to coast. 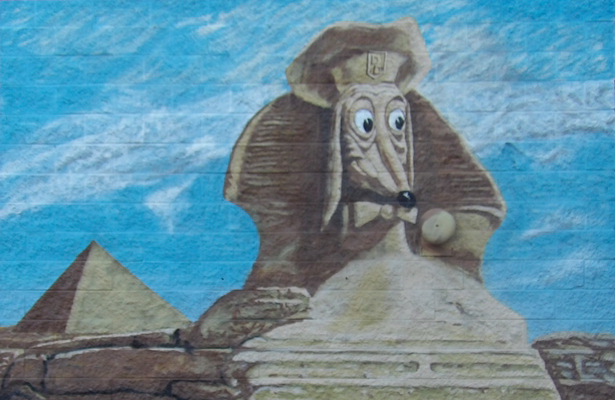 Doggie Diner Sphinx by Steve Bauer at Capp St. The Steward of the Great Dogs, Deacon Melmoth (John Law), routinely drives the massive trailer upon which the Holy Dogs are ensconced to a great variety of meritorious local history events.